Navaratna or 9 gems, Vedic talisman. The astrological Vedic text "Graha-Gocara-Jyautisha" gives detailed instructions on how natural gems can be fashioned into powerful jewelry, that attract good fortune and have a positive effect on the wearer. 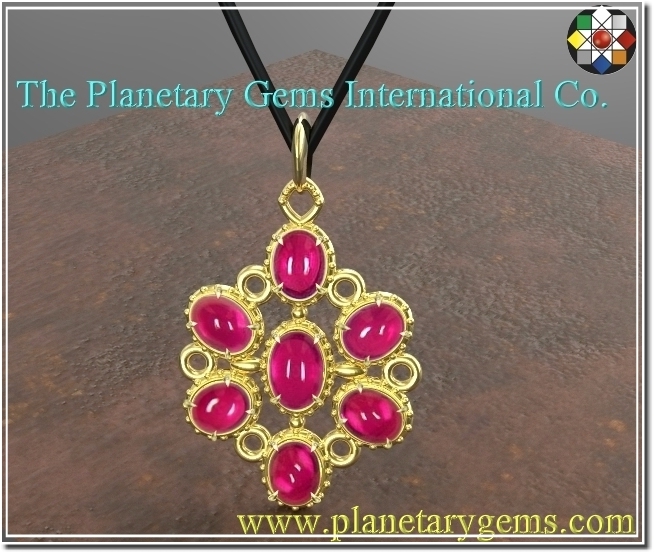 These planetary jewels are called "Kavacas", or Jyotish Talismans. Important: The following pictures are highly magnified (30X) and may not show the gems' real size, color and brilliance. See description for accuracy. Color can greatly vary from computer to computer, depending on your monitor's settings. Color will also, naturally, vary from sunlight to indoor, incandescent light. Dark and lighter areas are effects from the digital camera. 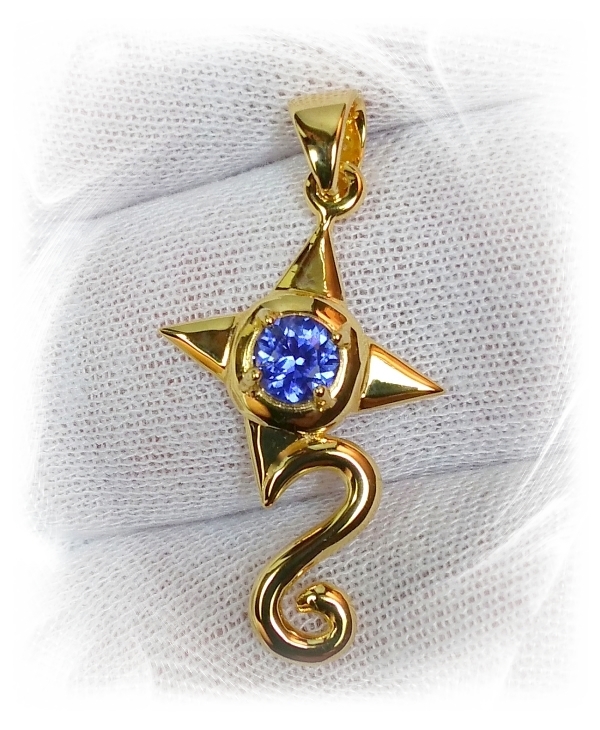 Mystical, 14K yellow gold "the spiral", Jyotish pendant with unheated, Ceylon blue sapphire. A most mystical, utterly unique, Saturn | Shani talismanic pendant, featuring an unheated, Ceylon blue sapphire, weighing 1.20 carats, medium-light, "cornflower" blue color, perfectly executed, trillion, mixed cut, measuring 7.40 x 6.34 x 3.82mm, eye flawless, VVS1 in clarity, hailing from the gem fields of Marapana, cut and polished in Ratnapura, Sri Lanka. 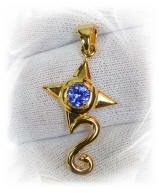 The spiral design is simply beautiful and very wearable, a Planetary Gems Co. signature. Consider that the granulation that you see (in other words, the little granules on the gold), is very tiny, intended as a motif first, and at the same time, adding substance and strength to the spiral itself. Real nice pendant here. 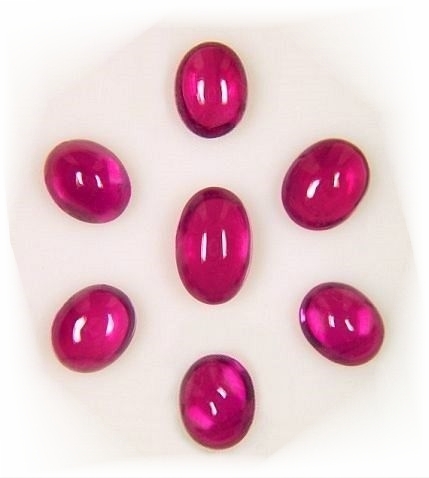 size 5.6 x 3.7mm center & 4.6 x 3.6mm average the remaining outer rubies, medium, intense, pinkish-red color, eye clean, VS2 in clarity, hailing from the Niassa region of Mozambique, that have only been traditionally gently heated with no added chemicals. Very transparent & clean stones. 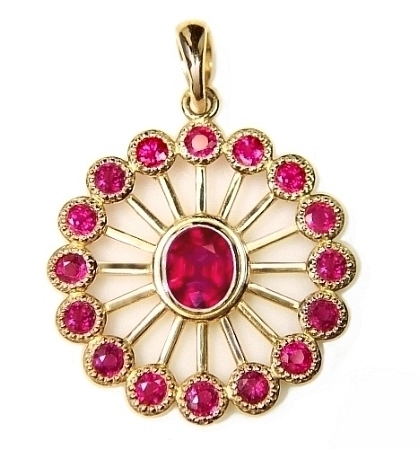 The gorgeous pendant is approx. 29mm long x 18mm wide. It is well crafted, sturdy and guaranteed a lifetime. The cabs are touching the skin for Vedic purposes. Set yourself apart. Delightful & magical, 14K white gold, Venus, astrological sign, Jyotish talisman. Modern with clean lines, 14K white gold | Venus, astrological sign pendant, featuring an unheated, Ceylon white sapphire, weighing 1.25 cts., fine white (colorless), perfectly executed, trillion, mixed cut, and measuring 6.60 x 6.60mm, eye flawless, VVS2 in clarity, from Sri Lanka. 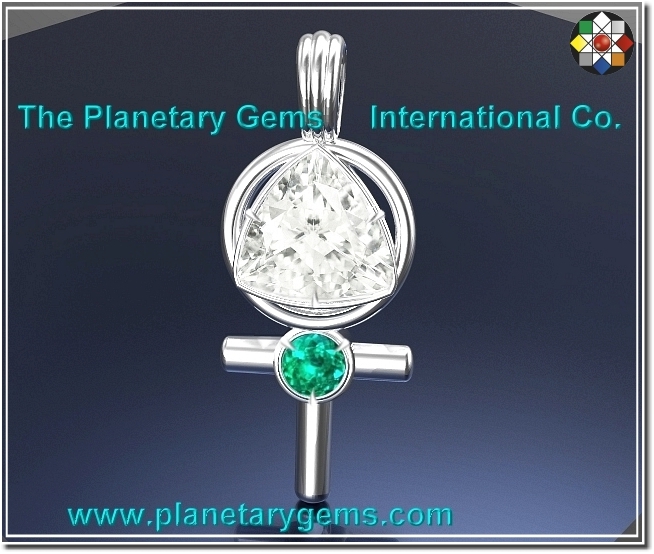 Also, complementing the white sapphire in the design is a natural Colombian emerald, bright, medium green, 2.75mm round, mixed cut, with excellent eye clean clarity. 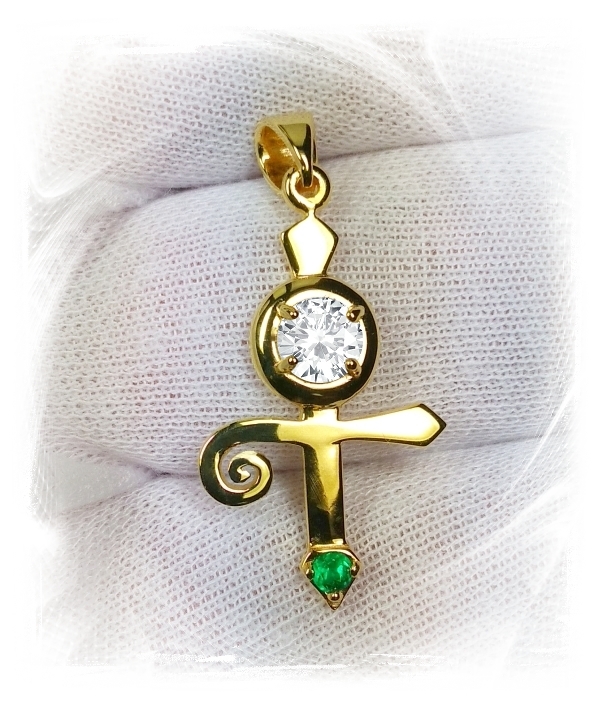 A very well crafted and sturdy pendant, with a modern look, guaranteed to last you a lifetime, with a length of 22.5mm (including the bail) an a width of approx. 10mm. Real nice and unique. 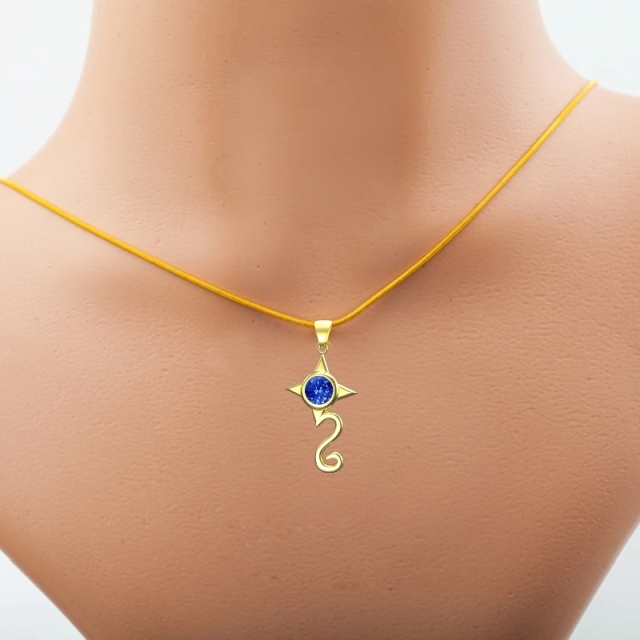 Uniquely captivating, 14K yellow gold, Rahu, astrological sign, Jyotish talisman. 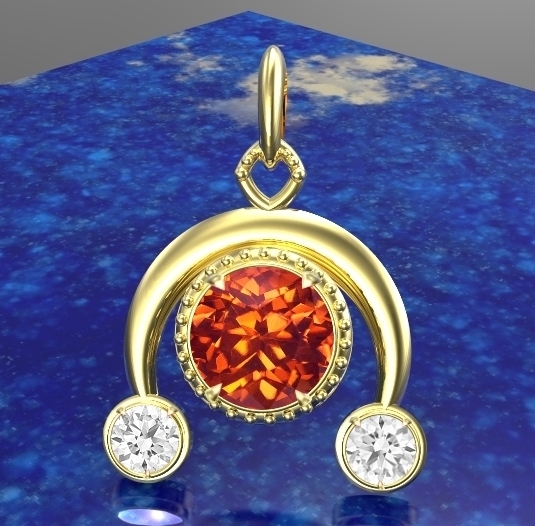 A most enthralling, 14K yellow gold | Rahu, astrological sign pendant featuring a super clean, Ceylon hessonite garnet, weighing 1.04 cts., finest, burnt orange color, medium-dark tone, very well executed, round flower cut, 6mm in diameter x 4.27mm deep, eye flawless, VVS2 in clarity, from Sri Lanka. There is also a match pair of Ceylon white sapphires, 3mm round, diamond cut, 0.30 cts total in weight, white and clean, VVS1 in clarity. 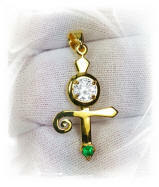 The 14K yellow gold pendant is sturdy, well crafted, guaranteed to last you a lifetime, measuring approx. 21mm long (including the bail), and 15mm large. 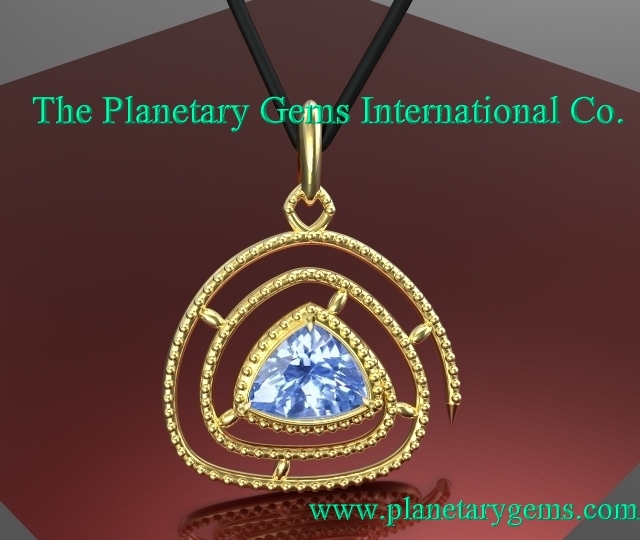 The Planetary Gems International Co. is the gold standard in Vedic Gemology. Spell-binding, 14K yellow gold, Venus, astrological sign, Jyotish talisman. What an unique & beautiful Vedic talisman to propitiate Venus. This well crafted & sturdy, fine 14K yellow gold pendant, showcase an unheated Ceylon white sapphire, 0.50 carats, very white in color, perfect 5mm round diamond cut, VVS2 in clarity, mined in the Nivitigala area, cut & polished in Ratnapura, Sri Lanka. The fine Colombian emerald is 2.6mm, very clean and with excellent color. The Colombian emerald is an old stock stone, so I say that the oiling is gone, so untreated. The pendant is 32mm long x 16mm wide and has a mirror finish. Needles to say, simply beautiful. Just the custom gold work is worth the whole price. The stones are free. Set yourself apart. Gorgeous, Very well crafted, 14KY gold, Saturn sign, astrological talisman. This is a very well made, 14K yellow gold, Saturn astrological sign talisman, showcasing a fine unheated, Ceylon blue sapphire, 0.52 cts., fine, medium-dark cornflower blue color, perfect round, flower, mixed cut, measuring 4.7mm in diameter, super clean, VVS1 in clarity, from the gem fields of Balangoda, Sri Lanka. It measures 33mm long x 15mm wide. Absolutely gorgeous, substantial & sturdy, and then this fine no heat, Ceylon blue of finest cornflower hue. The price is worth the custom made piece. The gorgeous sapphire is free. Only one ready-to-go, but can replicate it with any blue sapphire we have available. The Navaratna, King of Planetary Talismans. Delightful, well crafted, 5 grams of 14K yellow gold, and with a length of 1 1/8" from bail to bottom, mounting flawless, Jyotish quality, 4 to 4.2mm round, main gems (except for a flawless white sapphire instead of a diamond). 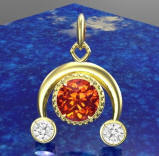 The top, finest quality of the 9 gems guarantee a powerful, uplifting and evaluative astrological effect to the wearer. We use only fine quality, untreated gems, all bezel set. These are truly beautiful jewels, masterfully done, and possessing a great, powerful, yet gentle energy. Only 4 available. Adorably shimmering & magical, unheated, Ceylon blue and pink sapphire, "Saturn" talisman. A visually stunning 14K yellow gold, "Saturn" astrological talisman, 3 grams in weight, mounting a center, unheated, Ceylon blue sapphire, 1 ct. in weight, medium-dark, "cornflower" blue color, 6x5mm, oval "flower" cut, flawless gem, IF-VVS from the gems fields of Elahera, Sri Lanka. The outer, spoked frame terminates to a group of 16, unheated pink and lavender sapphires, 2.5mm rounds, very bright, lustrous and eye clean, for a total weight of 1.60 cts. They are bead set in a wonderful granulation motif. Total carat weight of sapphires is 2.60 cts. and the center stone touches the skin. Well, it is just gorgeous, spiritually compelling and crafted very well. Very low price for all this work and quality stones! Yes, this can be used for astrological, Vedic purposes. Simply Mesmerizing. 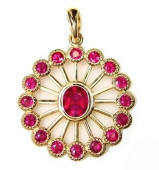 A most ravishing and beautiful, astrological, "Sun" talisman crafted in 14K yellow gold, mounting a center, unheated, natural Vietnamese ruby, weighting 0.79 cts., top, "pigeon's blood red color, eye clean, VS1 type2 from the Luc Yen mine, Vietnam. The outer, spoked frame terminates to a group of 16 round Burmese rubies, weighting 1.53 cttw., 2.5mm rounds, very bright and lustrous "neon", pinkish-red color, eye clean, VVS type2 from the gem fields of Mong Hsu, Upper Burma. They are bead set in a wonderful granulation motif. Total carat weight of rubies is 2.32 cts. and the center stone touches the skin. Well, it is just gorgeous, spiritually compelling and crafted very well. Very low price for all this work and quality stones. "Navaratna", king of Planetary Energies, 4mm loose set. 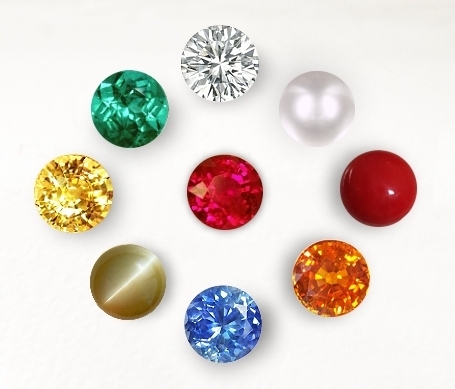 We have available a very limited number of fine quality, 4mm round, Navaratna sets. By popular demand, these are kept loose. Some of you will have them set in your own design, some will use them in your own home altar to perform propitiatory and religious activities. 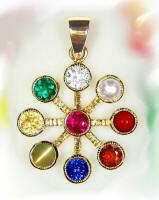 Beautiful Navaratna set, of high quality, untreated, Jyotish gems at a great price! Get yours today for auspicity, good vibrations and support of nature in your life.